No tears or fears here. The quartet from Boston, now based in Brooklyn, is currently tearing up the Hot AC charts with “Best Day Of My Life”. This band’s version is a folksy take with some really great uplifting harmonies and cheery hand clap line. This is as upbeat as it gets. The six sisters in this band have a fairly large viral following; I first blogged about them when their single “Made In America” went to radio in June. Their cover has some small lyric changes, but works well with a great vocal and some snapping fingers. Hawthorne is having a great year on my personal top 40 with three hits from his recent album, Where Does This Door Go. Performed live for VEVO, this guy is smooth and soulful. It’s a risky arrangement, but he and his band pull it off flawlessly. The Origibabes, as some call them, charted earlier this year in the U.K. with a song called “Flatline”. Their take is stripped down to just acoustic guitar and their three-part vocal, and the harmonies that they’re known for shine through beautifully. These gals from London just missed the U.K. top ten earlier this year with their debut single called “Trouble”. The quartet’s version stays true to the original with a little more hip-hop edge, along with a solid vocal and, of course, a cute British charm. They just released Overnight this year, and as a part of an ongoing web series, lead singer Will Anderson posts covers of current songs in the studio, just he and his piano. Bare bones and vulnerable, his emotive remake has a lot of girls swooning. At over twelve million views and counting, the five-piece a cappella group from Texas likely have the most watched cover when it comes to “Royals”. You know their vocals are rich and their percussionist is strong, making this quite the success. Disney kid and pop singer Gomez is touring around the world to promote her latest hit album, Stars Dance. Lorde’s publicly spoken out against her, but she keeps it restrained and to the point, and while it may not be the best of the bunch, it’s pleasant. Their self-titled EP went Platinum in Australia and just last week, their “Hold My Tongue” topped my chart. Maybe I’m a little biased when it comes to this sextet, but the initial sparse arrangement into pop/rock jam along with those harmonies is gold. From up north in Ontario, the quintet’s made a home for themselves on YouTube and on radio with singles like “Red Hands”. The five find the most inventive ways to cover songs, and this is no different, with rotating ukuleles, drums, keys and more. Just in case you can’t get enough “Royals” remakes, some other noteworthy versions out there include Kina Grannis & Fresh Big Mouf (August 12), MKTO (October 22) and Taryn Southern & Julia Price (August 4). 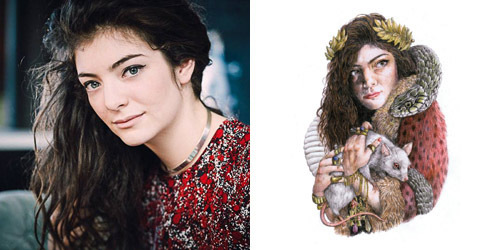 For more on Lorde and the rulers of the web and the charts, follow the blog below or hit the “Get Social!” tab to find out how you can connect with PGTC on social media.